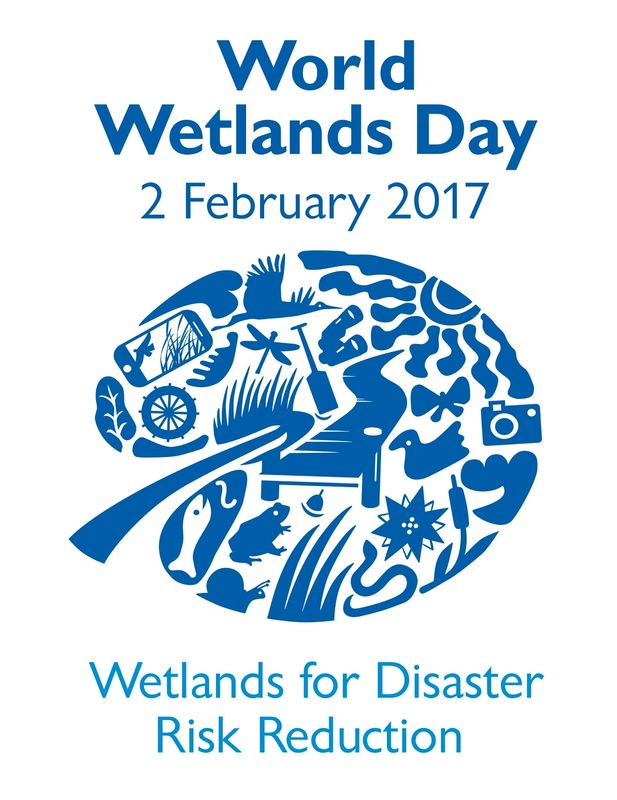 World Wetlands Day is celebrated every year on the 2nd February. It is initiated and organised by the international Ramsar organisation based in Switzerland. The theme for 2017 is “Wetlands for Disaster Risk Reduction”. The goal is to inform people about the importance of healthy, well managed wetlands which can reduce the impact of damage due to natural disasters. Wetlands are of the most important natural resources on earth. It ensures a balance in our bio-diversity and offers water, food and breeding habitat for a large variety of living organisms. One of the direct benefits of wetlands, specifically for humans, is the fact that wetlands can drastically reduce the risk of damage as a result of natural disasters. Statistics about these disasters are shocking: 1.35 million people died as a result of disasters between 1996 and 2015. In material terms, weather related disasters caused US$3.3 trillion in damage between 1980 and 2014. Defined as flat land areas that are flooded with water, either seasonally or permanently, wetlands are a natural buffer against disasters. The amount of water on planet earth cannot increase, but it also cannot decrease. The two factors that affect the availability of water are the population growth, and the management of water sources. Wetlands play a critical role in the management of water sources. It functions like a huge sponge that slows down the flow of water through an area and at the same time clear the water from impurities. In a way it is similar to the human kidneys: it absorbs and slows down the flow of water, filters impurities, and prevents major floods further downstream. When an extreme event hits, healthy wetlands can absorb some of the shock, cushioning the damage in local communities. In Hikkaduwa, Sri Lanka where offshore coral reefs are protected through a marine park, the damage from the 2004 tsunami extended just 50m inland. In nearby Peraliya, where coral mining had degraded the reefs, the damage extended 1.5 km inland. Wetlands can also speed up the recovery and help to “build back better” after a disaster, acting as natural water filters and nutrient restorers. After a 1999 cyclone that hit Odisha in eastern India, rice paddies that were protected by mangroves recovered their food production much more quickly than croplands without the buffer. Mangroves are salt-water tolerant shrubs and trees that grow in shallow, tropical coastal waters. Their roots bind the shoreline and reduce the impact of cyclones/hurricanes and tsunamis. A good example of a mangrove wetland is at the St Lucia lake in KwaZulu-Natal. Coral reefs are solid structures found in shallow, tropical waters and are built by living colonies of tiny coral polyps. In addition to being a habitat for several marine species, coral reefs also act as offshore wave barriers. The Coral Reefs of Tongaland on the northern coast of KwaZulu-Natal is one of South Africa’s Ramsar wetlands. During sudden floods, flood plains act as a giant reservoir which can spread and store flood water over a wide area, reducing damage downstream. When rivers flow into a wide, flat inland lake without draining into the ocean, an inland delta is formed. The best example is the Okavango Delta in Botswana which provides a habitat for a large number of animals, birds and plants in an otherwise dry, arid area. Peatlands are water-saturated lands containing decomposed plant material up to 30 meters deep that has accumulated over time. They cover 3% of the earth’s land surface and store more than twice as much carbon as all of the world’s forests combined. It play an important role in mitigating some effects of climate change. 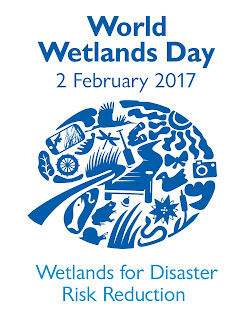 Several activities occur world wide to celebrate World Wetlands Day. Most of these are organised by the institutions responsible for the Ramsar wetlands of that country. I am aware of events in South Africa at St Lucia, Edendale near Pietermaritzburg, and Colbyn near Pretoria. The Department of Environment Affairs plans an official event for 17 February at Esselen Park Pans, Thembisa in the Ekurhuleni Metropolitan Municipality. If you are close to a wetland, contact them to find out what happens there and how you can get involved.